Among key facts that narrow it down, Southern ranked #8 has to be a big tip to the year. 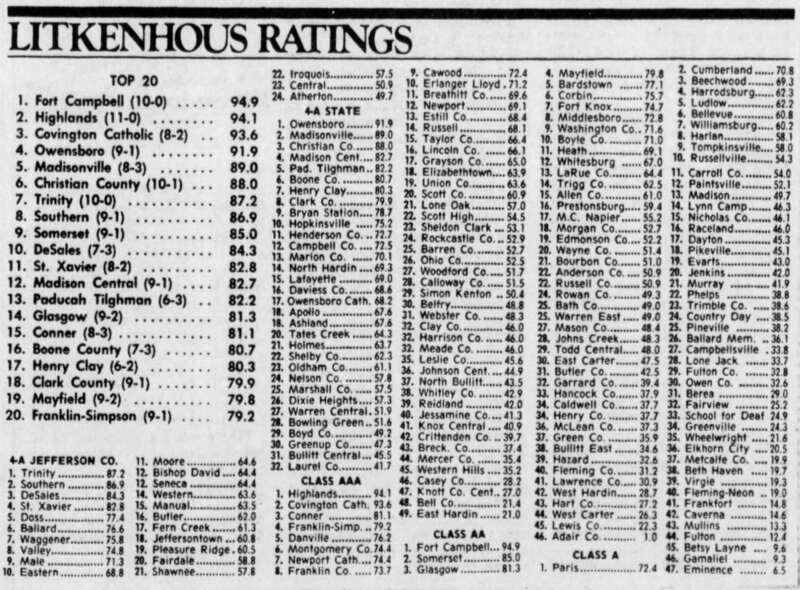 I was going to say early 1980s based on the presence of both Warren Central and Bowling Green in 4A State and near the bottom. And after looking at their records in the early 80s when they were in there, I see that Blockbuster and Hatz nailed it. It could only be 1982. Bowling Green was 2-9 that year, their only losing record in the entire time they were in 4A. That was a bad year for Bowling Green/Warren County. All three teams had losing records. The correct year is 1982, yes. @Blockbuster @Hatz ...what were the giveaways for you two? I'm late to the party but Bishop David being in the ranking should have help put a cap on it. AA was what I notice first. Somerset was great in AA in 1982 but Boyle upset them. Boyle was highly ranked in this one. Then I saw Danville was top five or so in AAA. That meant it was early 80’s. Final piece was Harrodsburg ranked Top five. They had a nice team in 1982 but not Paris nice. I might add that 1982 was first year in broadcasting football. In 3A, #1 Highlands and #2 CovCath played in the first round of the playoffs that year, a 13 - 7 Highlands win. If I told you that i'd have to kill you! I'm showing my age, but the specific records of a few teams I follow made it a dead give away to me. What was the last Jefferson County class? Last edited by NEERFAN; Jul 10, 18 at 09:26 PM. What was the last Jefferson County class end? I think 1986 was the last year for the Jefferson County AAAA districts.